Surat (India) based A Royal Co.® has introduced new Vision360° Mini for the Diamond Industry at JCK show - 2016. 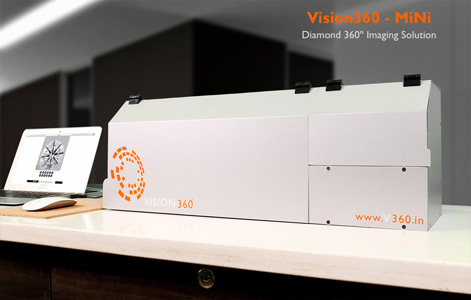 Vision360 is well known diamond imaging system, this new version is able to generate the diamond (0.10 to 100 Ct.) in 360° view for online merchandising process with lower cost. The Vision360° Mini come up with more advance features such as Portable, Heart & Arrow Add-On (First in segment), Focus Stacking, True Colour, True white Background etc. Vision360° MiNi is developed and upgrade on feedbacks of it’s large global customer group, to match their requirements such as correct diamond view, data management, system productivity and output integration into existing ERP. In two minutes process your scanned diamond is ready to share with anyone on any platform. Being able to see the stone in such detail means that it is no longer necessary to physically send the diamond to the buyer/seller, saving both side’s valuable time and money and speeding up the sales transaction.